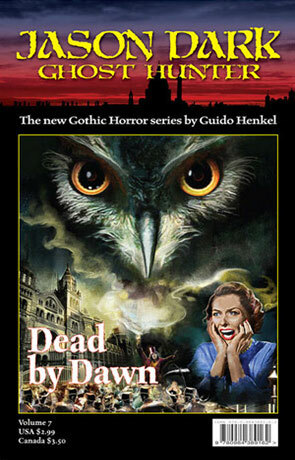 Dead by Dawn is the 7th novel in the Jason Dark series by Guido Henkel. A woman in good health dies overnight, and to make matters worse it's Jason Dark's next door neighbour who's snuffed it, something wicked is at work in London town. As his investigation leads him down to the seedy underbelly of society, things more mysterious than he expected reveal themselves, making it clear that the ghost hunter will need all of his skills and resources to put an end to the horrors that stalk the night. The seventh volume in the Jason Dark series of "dime novels" (essentially novella's) and the second that I have read see's the intrepid investigator and his glamorous assistant in Victorian London as he investigates a multitude of supernatural murders. There is less of an investigative feel to this volume and more of a traditional adventure with a darker edge that has slight gothic undertones. The plot is pretty straight forward and doesn't leave much for guess work but it is all wrapped up in well written atmospheric prose along with a nice pace. There is further development in the relationship between Dark and Lin, it's quite clear that they care a great deal about each other and work very well as a team. Jason Dark: Dead by Dawn is less in the vein of Sherlock Holmes than the previous episode which to me gave the series that edge, none the less a fairly good episode in an accomplished series. Written on 3rd January 2011 by Ant.